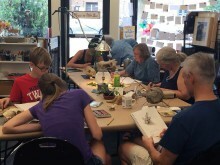 Join us for casual sketching in the Wet Paint classroom. Come for the whole time or drop in for a short bit. Bring your own favorite sketchpad and drawing supplies. We’ll have some materials out for shared use. You might discover something new!